A new report funded and supported by the UK government that accuses Israel of violating international law with its treatment of Palestinian child detainees was launched in London by a high-profile group of human rights lawyers on Tuesday. The report says Israel is in violation of the UN Convention on the Rights of the Child (UNCRC) on at least six counts and of the Fourth Geneva Convention on at least two counts. It lays bare the system of legal apartheid Israel maintains in Palestine. But there is pessimism in some quarters that the report’s recommendations will be implemented. The document has been criticized as “toothless” by a prominent Palestinian human rights activist. “Children in Military Custody” was funded and backed by the UK Foreign and Commonwealth Office, and written by an ad hoc group including a former attorney general, a former court of appeal judge and several prominent attorneys known as QCs. The delegation visited Palestine in September and met with Palestinian, Israeli and international nongovernmental organizations, British diplomats and a wide range of Israeli government and military officials. Israel currently applies two separate and unequal systems of laws in the West Bank. Palestinians are subject to a harsh military regime in which Israeli army officers and police, arrest, interrogate, judge and sentence, while Israeli settlers colonizing the West Bank are subject to Israeli civilian law. These systematic inequalities include: the minimum age for Palestinian children to receive a custodial sentence is 12, but for Israelis it is 14; Palestinian children have no right to have a parent present during interrogation, while Israeli children generally do. The most stark inequalities are evident in the time it takes for the two systems to work. 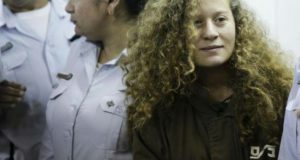 Palestinian children could have to wait up to eight days before being brought before a judge, while Israeli children have a right to see one within 24 hours; Palestinian children can be detained without charge for 188 days, while for Israelis the limit is 40. Drawing on their meetings with nongovernmental organizations such as Defence for Children International-Palestine Section, the authors detail the shocking treatment of Palestinian children at the hands of Israeli soldiers. Arrested in nighttime raids, Palestinian children are often physically and verbally abused, brought before adult military courts, shackled, given little choice than taking a plea bargain, and can be sentenced to as many as 20 years for “crimes” as trivial as stone throwing. Some are even kept in solitary confinement, according to DCI. The report compiles some shocking statistics. 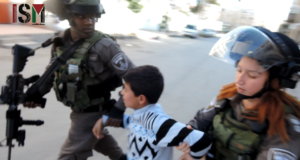 As many as 94 percent of Palestinian children arrested in the West Bank are denied bail, according to nongovernmental organizations. Some 97-98 percent of such cases end with a plea bargain, meaning they go to jail without even reaching the trial stage (as flawed as military courts are). A key conclusion reached by the report’s authors is that Israel is in breach of articles of UN Convention of the Rights of the Child (UNCRC) that prohibit: national or ethnic discrimination; ignoring a child’s best interests; the premature resort to detention, imprisonment and trial alongside adult prisoners; preventing prompt access to lawyers and the use of shackles. While the report notes “the International Court of Justice’s 2004 Advisory Opinion [on Israel’s wall in the West Bank] which concludes categorically that the UNCRC is applicable in the Occupied Palestinian Territories,” Israeli officials the delegation met with refused to recognize this. “In our meetings with the various Israeli Government agencies, we found the universal stance by contrast was that the Convention has no application beyond Israel’s own [pre-1967] borders,” the authors write, noting their disagreement. Renowned Palestinian writer, activist and academic Ghada Karmi was at the report’s launch on Tuesday. She asked the panel if it would be doing a follow-up visit, or monitoring implementation of the report’s recommendations. Karmi later told The Electronic Intifada that the report is “toothless in the end” because there is no way to compel Israel to comply. Lawyer Greg Davies was responsible for putting the ad hoc delegation together. 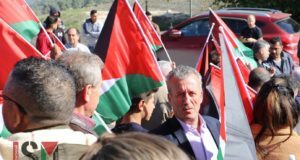 He told The Electronic Intifada that while he was doing so, he was approached by the British Consulate in Jerusalem, who offered government funding. Davies replied in the affirmative, but on condition that the group be independent. The Palestine section of Defence for Children International, through its reports and its meetings with the delegation, is one of the most quoted sources in the report. DCI-PS spokesperson Gerard Horton admitted to The Electronic Intifada that the report’s recommendations “won’t end the abuse,” but argued that some of them “will make it very difficult for the military court system to function effectively” if they were implemented. He wrote in an email that the report’s list of forty recommendations include those DCI-PS have been demanding for years (parents present during interrogation; prompt access to a lawyer; audio-visual recording of interrogations; and an end to forcible transfer of children to prisons inside Israel in violation of the Fourth Geneva Convention). Among the report’s forty specific recommendations are: an end to night arrests, an end to blindfolding and shackling, observing the prohibition on “violent, threatening or coercive” conduct, the presence of a parent during interrogation and “[c]hildren should not be required to sign confessions” in Hebrew, since they do not understand it. 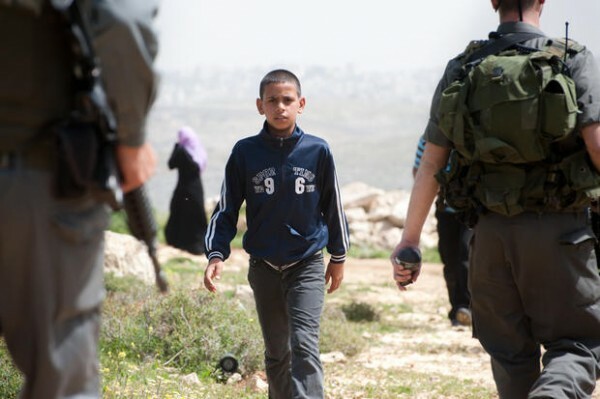 The report notes that since the delegation’s visit, a new military order has upped to 18 the age at which Palestinian children can be tried as adults. Previously, it had been 16 (then another inequality with Israeli children who are treated as children until 18). Asked by The Electronic Intifada at the Tuesday launch why there were no specific recommendations in the report to end this inequality, Judy Khan QC said it was covered by core recommendation three, which calls for an end to the current inequalities between Israeli and Palestinian child detainees. Sir Stephen Sedley, a former Lord Justice — senior appeal judge — underlined at Tuesday’s launch that there has been a 40 percent rise in child detainees since their visit in September, so the problem has only got worse since they returned to the UK. But the question remains: a fact for how much longer?